One of the most popular articles here at Natural Papa has been my post about Our Tiny House Experiment. From talking to other people who are looking to either live in a low impact way, or to simply save money, I have found that the tiny house concept is one that really resonates with them. 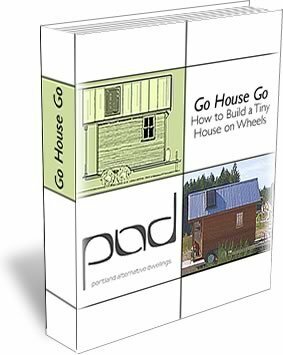 And thanks to the power of the internet, resources for how to make the transition to a micro house, how to build your own, or how to live in one, are only a click away. All about small/tiny house design, small cabins, yurts, log cabins, houseboats, off-grid living, salvage construction, dumpster diving, thrift living, and diy crafts and woodworking. Got any other tiny house websites we should be reading? Leave the links in the comments! Great stuff! I follow This Tiny House and Coming Unmoored already… also check out RowdyKittens (http://rowdykittens.com/). .-= Jessica´s last blog ..Green Living Gets Real =-. It is so nice to see conservatism come into popularity. Fantastic round-up! I discuss tiny homes on my blog too. .-= RowdyKittens´s last blog ..Just Do It! Challenges of 2009 =-. Wow, my bad. How could I miss Rowdy Kittens? I think it’s definitely possible – but your definition of ‘tiny’ might be bigger than others. Or you may find that the boys need a tiny house of their own to play in? Anything smaller than the average American single family house would be an improvement as far as environmental impact, I believe. omg! i think u are about to become my best friend! i love your writing lol mr perfect 🙂 and what a brilliant, helpful idea 🙂 came JUST at the right time – downsize, mid-life crisis etc BIG 🙂 will be following you – thanks!!!! I think too many people make the mistake of not being selective because they dont want to be perceived as a pest. Do you agree? I always liked those designs, but I wasn’t aware it’s so many of them! I followed all the links and the idea of opensource architecture is really great, unlike other links pointing to forty-something thousands dollar houses. .-= Serge´s last blog ..How much water does it take to make one latte? =-. I’m a huge fan of the TED talks – and Kunstler is a great no-punches-pulled kind of guy. Thanks for the link! Love this post! Its a great way to get back to the basics of life, family etc, when we’re not so focused on having “more”. The tiny house is like the Lap-Band surgery for your life, forcing you to consume less and in turn allow you to live more! .-= Danny´s last blog ..Surfing the Arctic =-. these exact words are what I’v been trying to tell EVERYone! keep spreading the word of living smaller! stace. Canadians live in the colder northern regions in Straw Bale home and Solar and wood heat – virtually free! while their Yankee counter-parts pay for oil and gas in the south! Smaller practical Straw Bale survival size homes in Canada are built and the folks that live in them swear by them! Whole books and complete plans can be had on this net! Look up “Straw Bale” to expand your mind! Look at what the Europeans call spacious – in Denmark, for example, or even a Paris apartment! You won’t see any Mc Mansions there! I need to be solidly attached to the earth and have storage space for my pressure canned garden preserves for winter survival here in Canada, so your plans seem a bit tight for me. Good luck! Keep on publishing! Especially space -saving ideas i love them, and if i get the chance to build another place will certainly borrow them, if not for my current smaller dwelling! A small mini basement will provide solid, non-movible foundation that will supply storage and even temperature. If used as an extra room, an egress window will be needed. It is always better to use a mini basement for utilities, access panels, pipes…if you can’t go out or up; go down! It is so nice to see conservatism come into popularity. Especially after the extreme excesses of the past decade. Builders couldn’t build 4000 square foot homes fast enough. Of course so many of them sit empty now. Cool, I’ll head over and check it out! http://www.tinyhouselistings.com is a new website where you can browse tiny houses for sell and rent. Awesome – I’ll add it here soon! I think I have room in my garden for a tiny house so I shall get my husband on it pronto, how nice to have two homes and he is a builder so it should be right up his street. Ooops, almost a year later and I forgot to say THANK YOU for including me in your list! Better late than never? Nice compilation of sites! I’ve only been to a few of these, but am gonna explore the rest now. I am with the design team for Blake’s Tiny House and we have just posted our design iterations 2.0 @ http://www.blakestinyhouse.com. We are trying something with the Tiny House movement by looking to foster an open and online design development of a tiny house. At our website you can download a SketchUp model or grab an image and feel free to sketch, manipulate, or redesign Blake’s Tiny House. We would love to see ALL of your thoughts and comments and will post them to our blog if you return them to us. Please join us in Blake’s journey! Thanks for the list, there were a couple of links I had not seen before. I’m building my own small house with the help of some friends. Feel free to watch my progress at my blog if you like. Roatan, Honduras is one of my favorite places…the tiny house concept would definitly sell there. I thought I would throw in a link for my site. I am a tiny house blogger. You have a great list! Thank you! Any chance you’d be willing to make this “17 Excellent Tiny Houses Resources” and add us? http://SmallHouseLife.com/ is a new site that is rapidly growing due to the overwhelming community support of interested readers. hey… my computer just blocked an attack from tiny revolution site. Blackhole kit, it said. I seriously doubt the people at tiny revolution are responsible, but they may not know that their site is being used for something like this. If you have an email contact for them, please give them a heads up. Thanks! Great site. I have a link to this site. we love tiny homes as well and love this blog site. My wife and I are building a custom designed Tiny Home on a gooseneck trailer and just about finished. We started it about 10 weeks ago and will be moving in this coming week. Our blog is at http://clotheslinetinyhomes.com/ and we are working on putting a pricing page together for anyone that would have intrest in ordering one. We will have a lot of options from a dry-in model to a complete finish. Great resources, thanks for sharing Derek. I have been following some of the resources you mentioned in your list and the others I haven’t explored before. Doing so right now. I am a lone voice in my community advocating small and tiny homes. It is ridiculous the way some folks build huge homes 90% of which they hardly use. My partner often comments on the fact that our family of four does not need more than a few square feet as the two kids are always attached to her and I am sitting close by working on my computer. Deek at Relaxshacks.com has a lot of unique ideas. For just plain practical advice, look at thefloatingempire.com, which is the blog of a couple who built and moved aboard a shantyboat made of recycled materials. Excellent, I’ll add them to the list shortly. Thanks! Hey! Thanks for listing us as one of your 16 resources. We’d like to let everyone know we are now celebrating our first full year on the water aboard The Floating Empire. We’ve just posted a summary of things that worked and things that didn’t. Thanks so much for the service you’re providing. Hello, I am a blogger with a tiny house fundraiser, check out my inspirations at Thanks for the amazing resources.